Hi, today I am going to share with you 3 lovely postcards that I received recently. 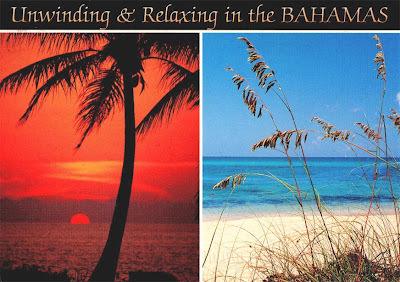 The first postcard was sent from The Bahamas. It is my first mail from this gorgeous country. Many thanks to Geria! Contrary to popular belief, the Bahamas is not in the Caribbean. It is actually a chain-like archipelago of around 700 islands (about 30 of which are inhabited) and a couple of thousand little cays that stretch out into the Atlantic ocean for about 75 miles east of Palm Beach on the USA mainland. 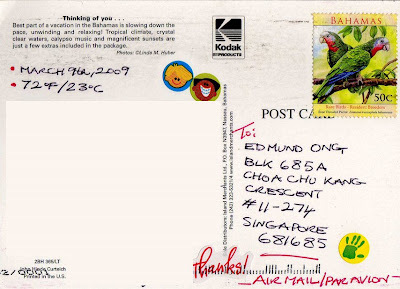 The beautiful parrots stamp on the postcard belongs to the "Rare Birds" series, issued in 2009. The complete set is shown here. 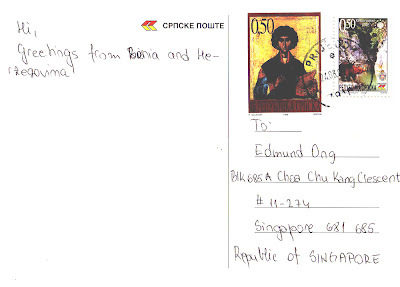 Next, we have a postcard sent by Maja from Bosnia and Herzegovina. It is also my first mail from this lovely country. Thank you! 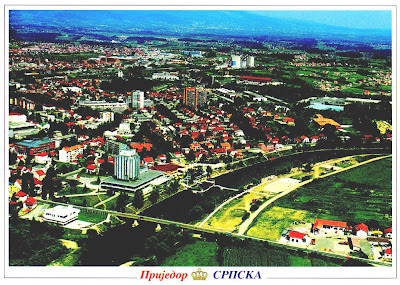 This postcard shows the beautiful town of Prijedor in northern Bosnia and Herzegovina. It is situated in northern part of the Republika Srpska entity and th bosanska Krajina region. Prijedor is the third largest municipality in the Republika Srpska entity. 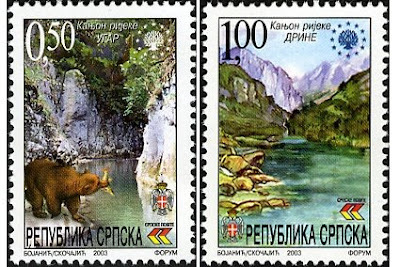 The stamps on this postcard belong to the “Paintings” series, issued in 1998 and “European Nature protection” series in 2003 respectively. 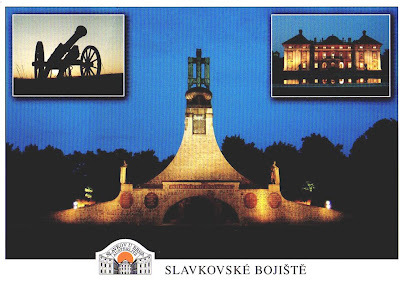 The last postcard for today is sent by Jarmila from Slavkov u Brna in Czech Republic. Thank you very much! 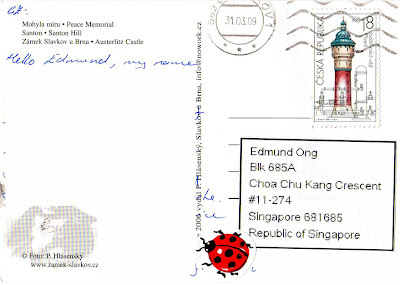 This card was postmarked on the 31th March and reached me on 4th April 2009. Slavkov u Brna is a country town east of Brno in the South Moravian Region of the Czech Republic. It has a population of 5,900. The town is widely known for giving its name to the Battle of Austerlitz which actually took place some kilometers to the west of the town. The postcard shows Mohyla miru (main), Santon Hill (left insert) and Austerlitz Castle (right insert). Mohyla miru (Peace Memorial) was built to honor the fallen of Napoleon´s victorious battle of Austerlitz (2. 12. 1805). According to the intention of priest A. Slovak it was to make a pious "place of light" out of the centre of a former battlefield – a memento of the wars. It is the highlight and natural centre of the protected historical monument area of the Battle of Austerlitz. 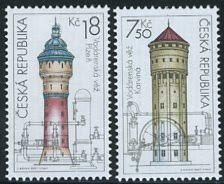 The stamp on this postcard is part of 2 stamps from the "Water Towers" series, issued in 2007.